Welcome to the Crafty Secrets March Linky Party. This month we're throwing a virtual Springtime Party and you are invited along as our guests of honor! Inspired by flowers and green growing things, we were challenged to "up cycle" something that would normally have been thrown away. I used an old lotion bottle to create this month's altered project using digital elements and papers from Crafty Secrets. By using the Eraser Tool in Photoshop Elements, I added script to the background to add texture and dimension. Measure your bottle. Then create a new artwork file to fit the front of the bottle. Then drag and drop the images onto the new artwork, making sure to layer the script element under the flowers. Select the script layer, then chose the Erase Tool, changing the brush, size and opacity to get the desired look. Then erase the script from the edge of the tag. Once the desired look is achieve, save your file and print. Cut out the tag, layering vintage lace and tea dyed canvas underneath. Glue a thin strip of fabric to the tag, leaving the ends open to be able to tie to the bottle. Next add vintage lace, seam binding, button and findings to complete the bottle. Now it's your turn! 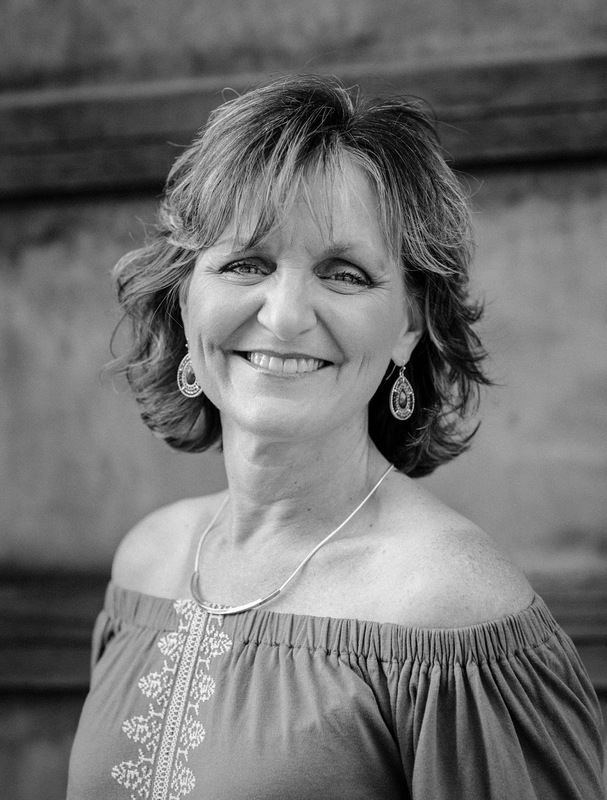 Visit each of the design team blogs listed below. Then create a NEW project of your choice featuring ANY Crafty Secrets product and link it up to the Crafty Secrets blog before Sunday, March 15th. You do not need to follow this month's theme to play along. If you do not have any Crafty Secrets goodies, check the FREE DOWNLOADS located in the sidebar of the Crafty Secrets Blog. Be sure to link to the Crafty Secrets Blog in your post and let us know that Crafty Secrets product you are using in your project. One lucky player will be randomly selected to win some fabulous Crafty Secrets products. Feel free to use these images or any Crafty Secrets goodies in your creation. 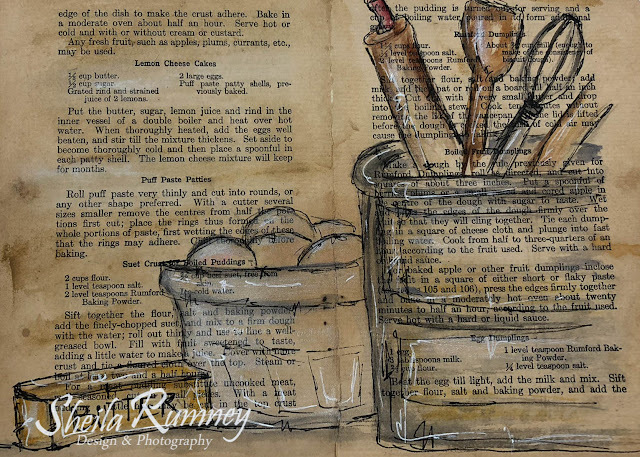 This is such a great project, Sheila, and your tutorials are always so easy to follow! Thanks for another great Linky Party! Your project came out so beautiful and so spring-y love that!! 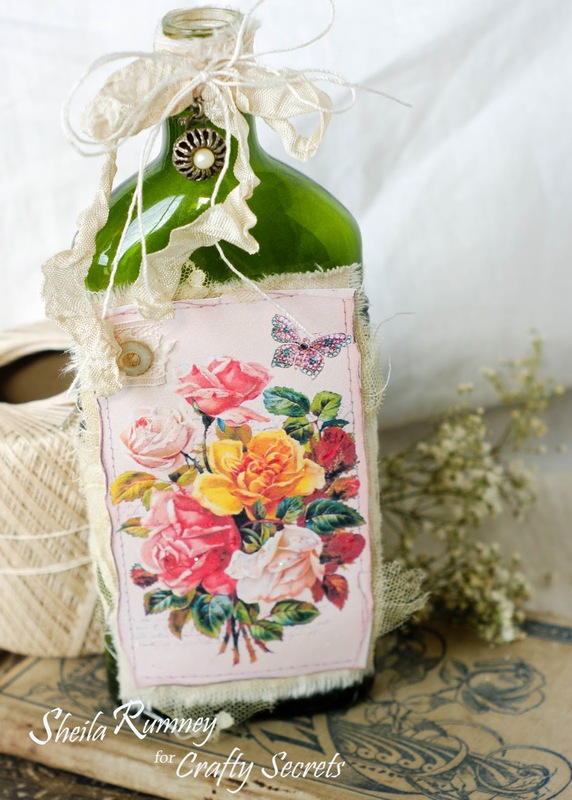 Beautiful Spring Time bottle decor piece....someday I hope to have photo Shop, and when I do, I know I can pop in here and learn so much!! So lovely, and such an easy-to-follow tutorial! This is just GORGEOUS! Will add it to my list of 'want to try this'. Thanks for all the wonderful inspiration and instruction! You know I totally love this bottle! It is stunningly beautiful I "need" to make them for my craftroom, and I love your tutorial too!!! Hi Sheila, I love how you added the script writing from the Artsy Banner set behind the roses! The way you show how to fade it back and erase the edges makes it look so natural, like it was all originally designed together. Thanks for another great digital tutorial! Somehow I didn't scroll roll far enough yesterday and missed your gorgeous project Sheila. It's so beautiful you just want to take the lid off and sniff at the contents. I always read every word you write and the case for photoshop is strong. Erasing is one of the things I want to be able to do. Sizing is also an issue in the program I use. If you added up all the wasted ink used in the way I do things it would probably pay for photoshop! Back to the bottle...since I couldn't see any frayed edges I presume this is paper you printed on. You made it look exactly like a heavy cotton. What a beautiful project you've created! Swoon! 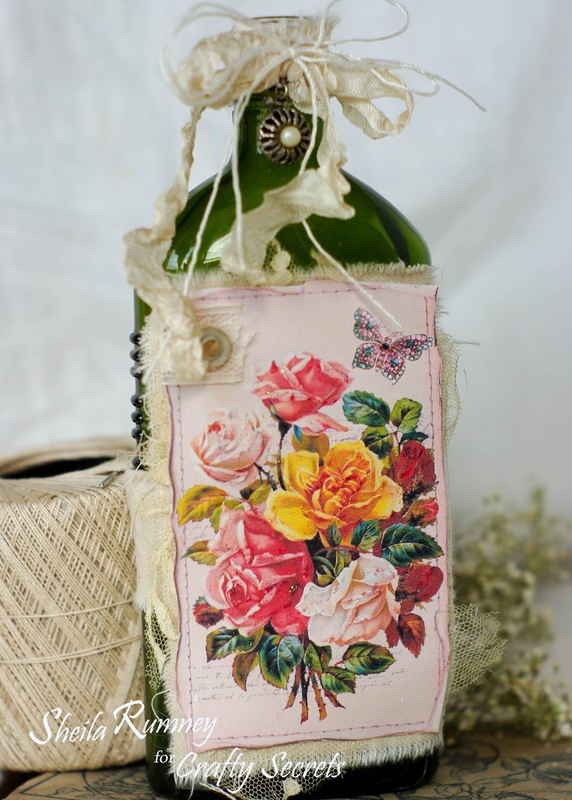 I love a vintage bottle, but one with vintage canvas....totally amazing!